I gave up my digital SLR (Canon 400D) for this Ricoh GX200, it was a difficult decision, but it was done for many reasons. The first was size. I found myself out and about a lot, forever wishing I had my 400D with me, but it was too cumbersome to carry everywhere. The second was concerts, try getting into a concert with a big SLR, not a chance. So, with both those problems solved, the GX200 was always in my pocket and even in the month I have had it, the opportune photos have made me smile. The camera is very compact, think of a small Sony or Canon Powershot, but with a VERY professional feel to it. The only things that makes this a little bigger is the lens protrudes a little from the front. This didn't bother me though, because I had gained a really useful, compact, 12 megapixel shooter. Around the back is a nice sized screen, very crisp and clear. When you rotate the camera, the image rotates too. 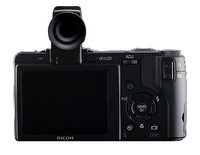 It has an electronic level in it too, so you can sure of take square-on and level horizon shots. The menu system is really easy to navigate and the controls (although there are quite a few buttons) are superbly laid out. The top dial allows you to take photos in Auto, Manual, Program and Scene modes. You also get three sections on this top dial where you can store your favourite settings, which is really useful. The flash is on a separate slider switch, so can easily be activated or turned off. The 1:1 square mode is superb. I use this to take photos for my website and they come out square. So I do not need to crop them after putting them on my Mac. I also love the three presets for storing my settings. They are so easily accessible on that top dial by selecting MY1, MY2, or MY3. Plus, the manual controls make this feel very creative. It sets itself apart from the cheaper run-of-the-mill models though, with rich, detailed images, that seem to pop, rather than be very flat in their appearance. I must admit, that I am not missing my digital SLR at all. I used this little wonder at two of my recent exhibition outings. Taking photos all day at MacLiveExpo and the Stuff Live events, without any problems at all. I think you will agree that the photos I took look pretty darn good. Also, in with this kit I got the VF-1 electronic viewfinder. This add-on attaches just behind where the flash pops up. It gives you a tiny little screen, that replicates the image and all of the information that you get on the main display. A tiny button just above the main screen, allows you to switch between the EVF and the 2.7-inch screen. Now, I love the large screen, it is so clear and bright, making it a joy to use. However, since using the GX200 at the exhibitions, I have found a couple of outdoor situations, where the sun was so bright. So, I popped the VF-1 on and the problem was solved. So, if I am ever planning photos outside, I pop the tiny EVF in my pocket (in the supplied case). The lens cap is really bad. It is not integrated, so you have to put it in your pocket when you are using the camera, or leave it dangling on the string. I spent an extra £12 on a pop open lens cover, that remains on the GX200 all the time. This is a professional piece of kit. Produces superb photos and the battery lasts ages (about 400 photos). It was well worth spending the extra on this brand for the build quality alone. Add into the equation that you get fantastic quality images too, on par with up to £500 digital SLR's and you have a real winner. This review is sponsored by Clifton Cameras.